After the FOMC came through in a big way for the bulls yesterday, equity futures are quiet this morning. Over in the Nasdaq, things are looking brighter as an 11% rally in Facebook (FB) following its earnings report last night has the stock on pace for its best earnings reaction day in three years! In more global macro data, the President is busy on Twitter this morning discussing the topic of Chinese trade and saying that no deal will be made until he personally meets with Chinese President Xi in the “near future.” Jobless Claims were just released and saying they surged would be an understatement, as they rose from 200K up to 253K, the highest weekly reading since September 2017! 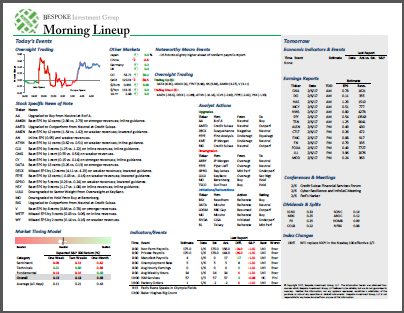 Read today’s Bespoke Morning Lineup for more on what’s driving the markets this morning. It wasn’t long ago that the market would seemingly go months on end without a daily move of 1% let alone 2%. With the help of the Fed’s dovish turn yesterday, though, the Nasdaq rallied over 2%, making it the 24th time in the last 100 trading days that the index moved up or down 2% in a single day. That works out to an average of more than once a week! 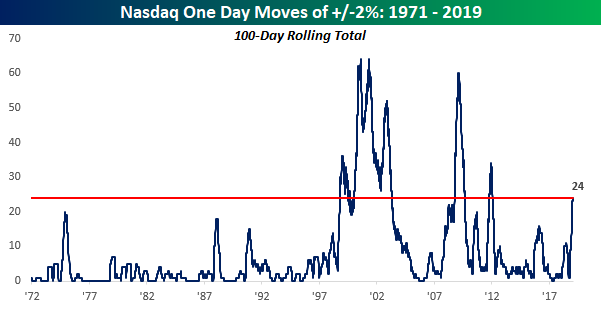 The chart below shows the historical 100-day rolling total of occurrences where the Nasdaq saw an up or down move of 2%+. The current level of 24 is now the highest total we have seen since early 2012, and only the fourth such period in the index’s history. Granted, the period in the late 1990s/early 2000s lasted a long time and saw a much higher frequency of 2% at its most extreme points, but these periods of large day to day moves are still relatively uncommon. Just as interesting is how the period from 1972 through the mid-1990s saw so little in the way of big daily moves. But once the late 1990s rolled around, the beast was awoken.